The Town of Hanover and surrounding region is a part of what is known as "The Upper Valley". This designation refers to a geographic area stretching along both sides of the Connecticut River in central New Hampshire and Vermont. Each Upper Valley town has its own distinctive character and beauty. Hanover is home to Dartmouth College (one of the Ivy League colleges and the ninth oldest college in the nation) and enjoys a lively, ‘New England cosmopolitan’ business district. The area offers an incredible mix of activities, thanks to the great outdoors, including the Connecticut River, the White and Green Mountains, the arts and culture community, and the benefits of intellectual activities found in a college town. Throughout the region, you will enjoy beautiful scenery, independent shops, and activities that showcase the local community flavor. Thank you for choosing the Hanover area as your destination. More on Hanover. Download our Community Guide Here. 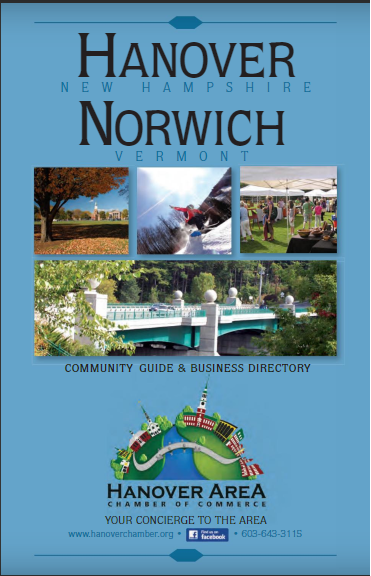 Norwich, Vermont is just across the Connecticut River from Hanover, New Hampshire. It was chartered in 1761 by Governor Benning Wentworth, the royal governor of the Province of New Hampshire. Here, Capt. Alden Partridge founded The American Literary, Scientific, and Military Academy, the forerunner of Norwich University in 1819. (Norwich University moved to Northfield, VT in 1866 - an interesting story you can learn about at the Norwich Historical Society). Close-knit neighborhoods are a cherished feature of life in Lyme, dating from the days of its thirteen school districts, when children attended one-room schoolhouses dispersed throughout the town, a system that remained in place until 1959. Outdoor recreation is an important part of life in Lyme. The Appalachian Trail runs through the eastern part of town over Holt’s Ledge and Smarts Mountain. The Dartmouth Skiway occupies the slopes of Holts and Winslow, straddling the old Grafton Turnpike. Post Pond is a popular winter destination for ice skating and fishing. Public trails on town conservation land offer hiking, snowshoeing, and cross-country skiing, and the Lyme Pinnacle Snowmobile Club’s energetic membership maintains miles of trails. Check out our Virtual Visitor's Guide!